The Last Quarter Moon is Monday February 1. Jupiter is visible in the late evening sky. 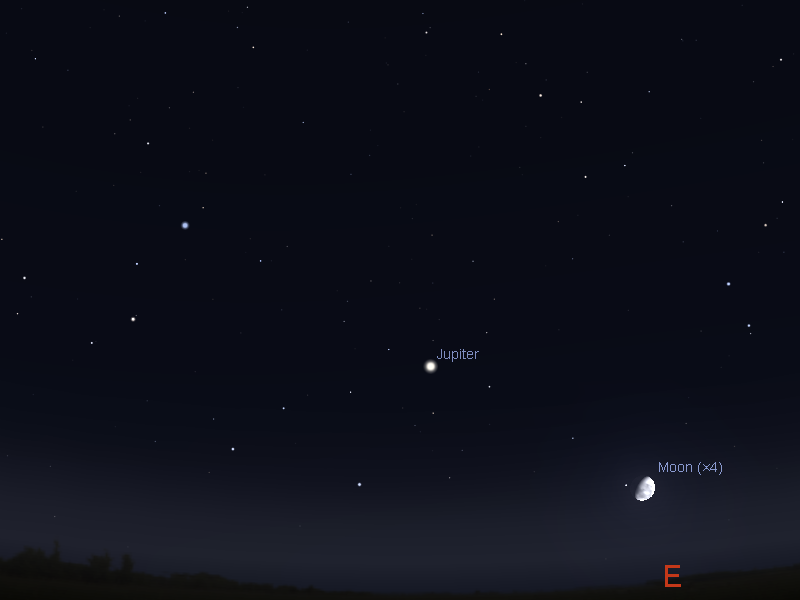 The Moon is close to Jupiter on the 28th. All five bright planets; Jupiter, Mars, Venus, Saturn and Mercury form a long line in the morning sky. The Moon is close to Mars on the 2nd and Saturn on the 4th. Saturn is close to the red star Antares. Venus is within binocular distance of the Globular Cluster M22 from January 29 to February 2. The Last Quarter Moon is Monday February 1. The Moon is at apogee, when it is furthest from the Earth, on January 30. Evening sky on Thursday January 28 looking east as seen from Adelaide at 23:55 ACDST. Jupiter is above the horizon shortly before midnight with the Moon close by. Similar views will be seen elsewhere in Australia at the equivalent local time. (click to embiggen). Jupiter enters the evening sky before midnight daylight saving time, it is low on the horizon for most of the week. Early morning sky on Tuesday February 2 looking east as seen from Adelaide at 5:00 ACDST showing Mars with the Moon nearby, Saturn with the red star Antares close by, Venus and Mercury. Similar views will be seen elsewhere in Australia at the equivalent local time. (click to embiggen). Mars is higher in the morning skies and is readily visible in the pre twilight dark. Mars comes closer to the bright star alpha2 Librae, Zubenelgenubi, during the week and is closest on February 1 when the pair are just a finger-width apart. 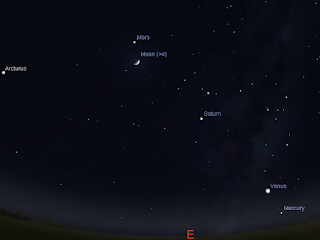 The Moon is close to Mars on February 2. Venus is easy to see in the morning twilight. It is a distinct "gibbous Moon" shape and is nice in a small telescope. Venus traverses the lid of the teapot of Sagittarius and is close the bright globular cluster M22. It is within binocular distance of the cluster from January 29 to February 2, being closest on January 30. Mercury is low in the morning twilight. It climbs higher in the twilight sky, brightening and coming closer to Venus. 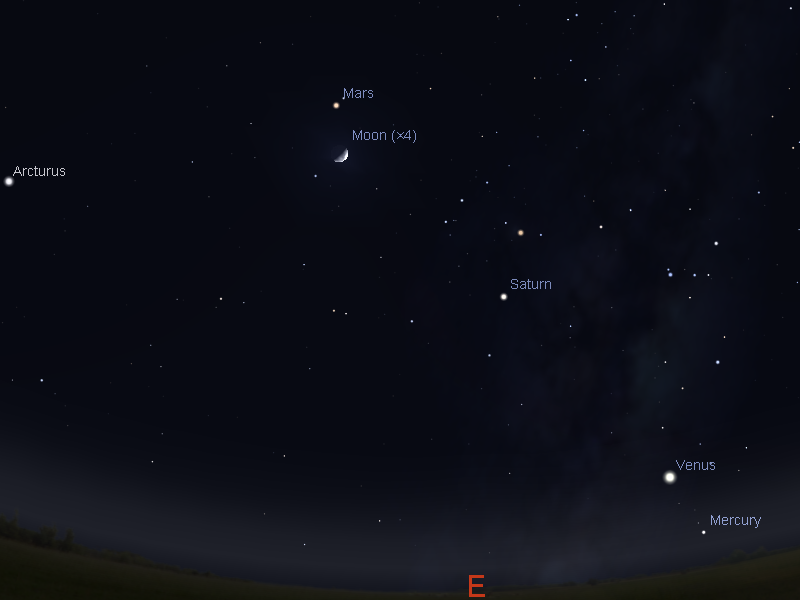 This week all five of the bright planets are visible in the morning sky, the first time this has happened for 10 years. Saturn and the red star Antares are close. During the week Venus moves away Saturn and enters the lid of the teapot of Sagittarius coming close to many nebula and clusters. You will need binoculars to see this, and the brightness of Venus will make the clusters hard to see. Mercury climbs higer and comes closer to Venus.